Rainforests conjure up mysterious, steamy expanses of lush green foliage; chattering birds and monkeys; and earthy, loamy smells. 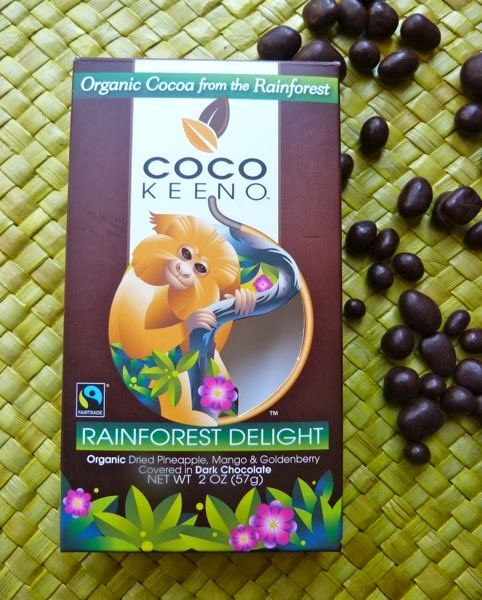 Bright, tropical fruit flavors shone through the organic, dark chocolate covered bits of organic dried pineapple, mango and goldenberry in today's box of "Rainforest Delight" from Wonder Food Co. (Palm Desert, CA). The dark chocolate was dark and rich, earthy, and slightly bitter. The tiny pieces of pineapple and mango were strong enough that I could pick out these flavors. The goldenberry was a bit more subtle; and the flavor I detected was close to that of a golden raisin. This was an interesting tropical mix over all, lacking in artificial colors or preservatives, and presided over by two golden tamarin monkeys (mascots Coco and Keeno) printed on the packaging. 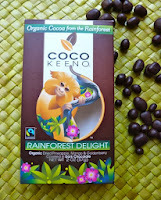 This Rainforest Delights mix was part of the company's Coco Keeno product line.